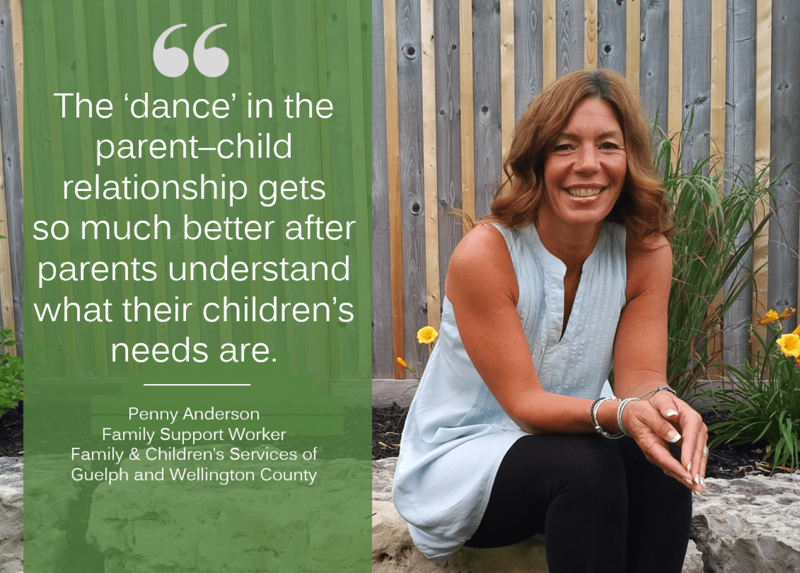 Penny Anderson, a Family Support Worker at Family and Children’s Services of Guelph and Wellington County, describes how Circle of Security makes lasting improvements in parent–child relationships. The primary goal of Children’s Aid is to keep struggling families together more safely. How does Circle of Security support this goal? Parents who attend the 8-week Circle of Security program have either been referred to the Family Support Program through their worker because of conflict at home or they have heard good things about it in the community and simply want to come and learn. We run the program here at our agency three times a year — fall, winter, and spring — in a group setting with 8 to 12 parents. And we also run it with clients one-on-one in the comfort of their homes. We also do this work one-on-one with parents who have children in foster care, where we’re assessing their parenting and looking for reunification. What we do is show parents a series of video clips of infants and toddlers and younger children so parents can learn to read their children’s cues, protect their children, promote healthy independence, and help their children with their feelings. Many staff in the organization have been trained to deliver Circle of Security, including everyone on our Family Support team as well as Family Service, Children’s Service, Foster Care, and Adoption workers. Our agency’s goal is to ensure that all staff understand the Circle approach. That way we’re all speaking the same language with parents as we are supporting them to learn new ways to be with their children. What is the ‘circle’ in Circle of Security? How does this ‘circle’ help parents to avoid conflict with their child? If the parent–child relationship is problematic, behavioural strategies and all that other stuff doesn’t work. Not until you have a healthy relationship, until the child trusts the parent. So it has to start here. Until this child feels safe and secure emotionally and physically with you, this bedtime routine is still going to be problematic. Getting him to school every morning is still going to be a fight. Then parents are kind of more open to, “Well I’ve got to change how I respond.” And maybe start looking at themselves rather than saying, “Well if he didn’t act like this…” Instead, they ask, “What part do I play in this dance?” So I find it’s a really kind, soft, and gentle approach to have parents be really reflective. One of the key moments in this program is when one mum in the DVD clip says, “I no longer look at his behaviour as attention seeking but rather connection seeking.” And I think when the parents hear that phrase in the program, they go, “Wow! I’ve been told to ignore attention-seeking behaviour. Now I know what kind of need it is and how I should respond.” Because what the child is really saying is, “I need you right now.” I’ve just seen such huge improvements in parent and child relationships using this type of intervention. What impact does this realization have on how parents deal with conflict with their children, and in particular, how they discipline? When we think about neglect and emotional harm, some parents don’t understand that isolating a child when they’re distressed is emotionally harmful to the child, to their brain development, to how they socially and emotionally mature. But for some parents it’s actually a strategy they use, so they aren’t physically abusive. They think, “I used to get hit or physically punished, so I feel I’m doing better than my parent did because at least I’m just walking out of the house or locking them in their room.” But when we’re able to show them through Circle work how that impacts their child’s brain development and how they maintain friendships and relationships, they start to see how they need to do it differently. What do you think explains the success of the program? When parents can start to look through their child’s eyes you’ll often have a lot of “Aha!” moments with parents where they’ll go, “Oh my Gosh, I do this with my kids too. And mom used to do this with me, and I never liked how it felt. But look, I’m doing it as well.” So those kind of “Oh wow!” moments, they make shifts then. And they’re sustained shifts in how they parent for the most part. So it sounds like a key component of Circle of Security is helping parents understand how their own parents didn’t meet their needs that are laid out in the ‘circle’. I would say that over 75% of the people that participate in Circle have had significant childhood trauma, emotional neglect, sometimes physical neglect, considerable losses. Lots and lots of repeated losses in their life. Nothing’s ever been stable or secure for them. So it’s really hard for them to trust in that. But they desperately want something different for their children. I have yet to see a parent enter the program that didn’t want life to be better for their child. They have to reflect on when they were a child and were their parents able to be with them, understand them, and work through these feelings. As a parent, I may have struggles because as a child it wasn’t something I received from my caregiver. What has been your experience with parents who have completed the program? As a result of being in Circle, parents start to have these small successes with their child. They have one success after another, until they feel their own confidence as a parent. And when that confidence is there, then I really see them flourish. And I’ve had some parents that I’ve done it with more than once because they’ve said, “I need to do it again. I don’t feel I have it yet,” and we do it again. Because there’s more that you can learn each time. It’s really neat. Penny Anderson is a Family Support Worker at Family & Children’s Services of Guelph and Wellington County. She help parents find new ways to manage their child’s behaviour, build better relationships with their children, and improve how family members talk and listen to one another. Read about one mother’s journey of coming to terms with her son’s fetal alcohol syndrome and how Circle of Security helped to improve their relationship.